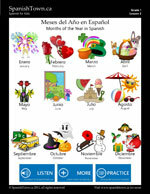 Learn the months of the year in Spanish. 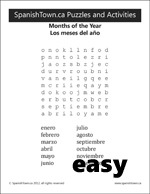 Below are the months, including spelling, in Spanish. You can tap the month with your finger or click it with the mouse to listen to the correct pronunciation. Print out the free vocabulary sheet. Below are the individual pages for Lesson 3. Visit the pages for free PDF downloads.